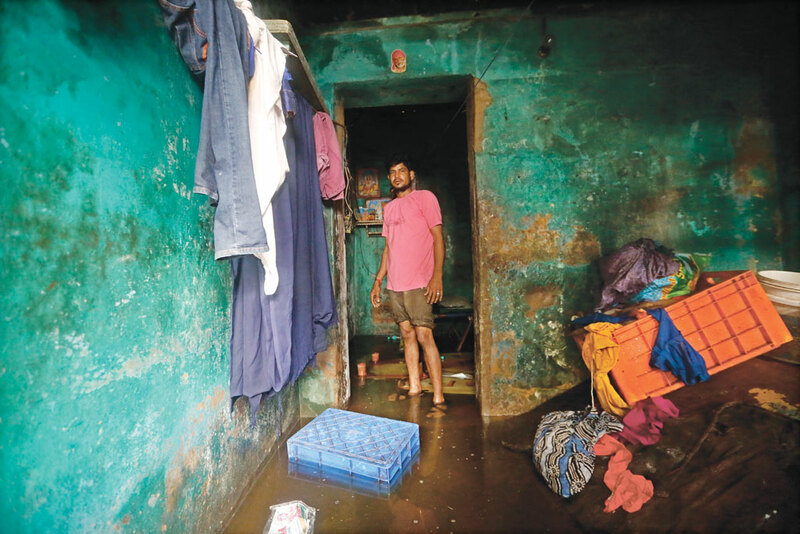 On December 1, houses on the ground floor in Jafferkhanpet, a neighbourhood in southern Chennai, started to inundate because of torrential rains. By five in the morning, almost 80 per cent of the city was under four metres of water. The situation continued for the next 72 hours, killing more than 500 and destroyed infrastructure worth Rs 500 crore. It was most intense of the three spells that had battered the city in just one month. Earlier, the city had received incessant rains from November 11 to 13, and then from November 15 to 17. Chennai received 1,200 mm of rainfall in November 2015, which was the highest rainfall the city received in November in the past 100 years. The city on an average receives 407.4 mm rainfall in November. On December 1, Chennai received 300 mm rainfall, making it the wettest December day ever recorded in the city. The normal rainfall for Chennai in December is 191 mm. A closer look suggests that the intensity and the resultant losses due to the recent floods could have been greatly reduced. Tamil Nadu faltered on several accounts. Firstly, it failed to act despite a clear warning from the India Meteorological Department (IMD) of heavy rains. Secondly, the state administration has over the years done little to prepare for disasters despite being flood-prone. 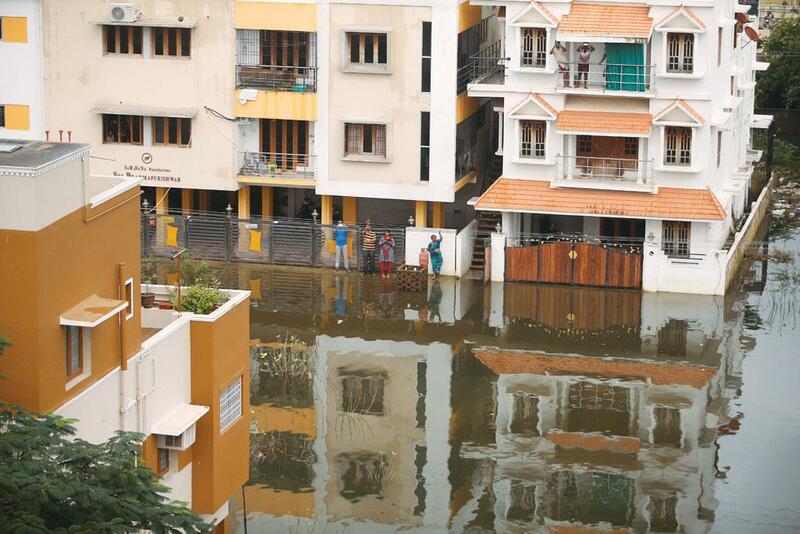 Thirdly, Chennai and its neighbouring areas have witnessed unplanned urbanisation in recent years that has destroyed the city’s natural flood sinks such as marshlands and river channels. IMD in mid-October issued a forecast that predicted 11-12 per cent above normal rains in the southern states with a probability of about 90 per cent. It had said that the northeast (winter) monsoon, caused by retreating monsoon winds that attain moisture from the Bay of Bengal on their way back south from the northeastern direction, would be stronger. These winds are responsible for the rains in the southern states of Andhra Pradesh, Tamil Nadu, Kerala and parts of Karnataka between October and December. The IMD forecast though did little to prepare the states for the situation. On December 1, an ill-prepared Tamil Nadu administration decided to open the gates of the Chembarambakkam reservoir, and the released water inundated the city. A public interest petition filed in the Madras High Court against the Tamil Nadu government suggests 1,104 cubic metres per second of water were released into the Adyar river, which meets the water requirements of the city. Highlighting how the decision was delayed, the petition, filed by Chennai-based businessperson Rajiv Rai, says that the water was released after a warning was issued at midnight. “If one studies the levels of water in the various catchment tanks on a daily basis, one can see that the reservoirs had much greater inflow than outflow right through November 2015,” says the petition. It alleges that state chief secretary K Gnanadesikan waited for three days after the Public Works Department (PWD) wrote to him on November 29 to release water from the reservoir. “The chief secretary, even though he was well aware of the reports that there was going to be heavy downpour for a few more days, didn’t direct the release of water when he received the warning from PWD,” the petition says. The administration was caught unawares despite the fact that floods are not new to the state. According to a 2013 Comptroller Auditor General of India (CAG) report, there have been 50 cyclonic storms in the region between 1900 and 2009. Even the hazard profiles of coastal districts prepared in the aftermath of the 2004 tsunami that hit the Tamil Nadu coast shows that most of the coastal districts experience flooding during the retreating monsoon, which normally accounts for 48 per cent of the rainfall in the state. “Heavy rains during the months of October, November and December inundate low-lying areas, coastal areas and the areas nearby major irrigation sources,” states the disaster profile prepared by the district administration. The level of unpreparedness of the city administration can be gauged from the fact that the Chennai Metropolitan Development Authority (CMDA), the key urban planning agency for the city, still relies on an outdated hazard profiles of Tamil Nadu, which says none of the areas in the state are flood-prone. According to CMDA’s hazard profile document, “From the flood hazard map of India (mapped by IMD, New Delhi), it is seen that no area in Tamil Nadu falls in the risk zone.” The document says that few areas in Chennai might get flooded due to heavy storms and for this, flood affected areas have to be mapped. According to N Madhavan, who has worked with the Municipal Corporation of Chennai, ward-level vulnerability mapping was done after the 2004 tsunami. “These efforts went waste as boundaries of wards and zones changed following the expansion of the city,” says he. The callousness of the state administration does not end here. The State Disaster Management Authority, which was set up in 2008 under the Disaster Management Act, 2005, has not even met once, according to the 2013 CAG report. Close to seven years later, the state is yet to come up with disaster management rules. It was only in May 2015, following the Nepal earthquakes, the Municipal Corporation of Chennai started preparing a comprehensive disaster management plan which predefines the roles of officials during a disaster. The northeast monsoon is generally known to bring a few heavy showers amidst scanty rains to the southern states. 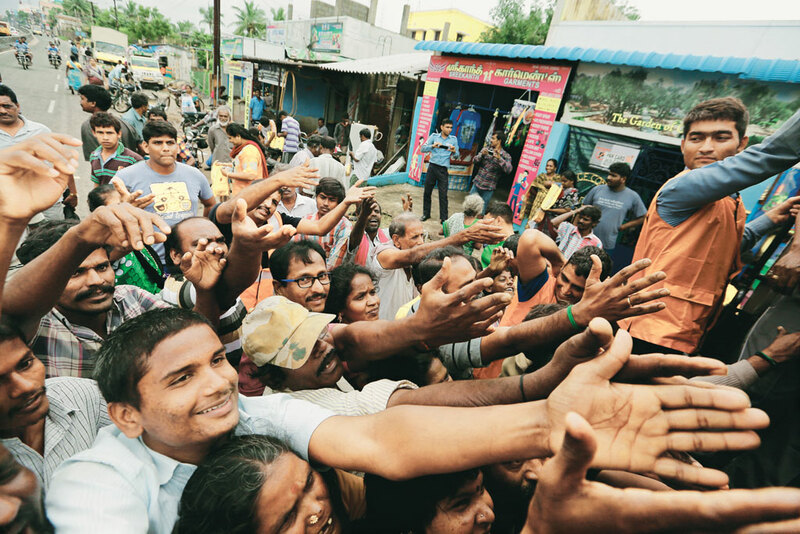 Between October and the first week of December, 27 of the 34 districts in Tamil Nadu and Puducherry had received 10 per cent excess rainfall with several districts registering more than double the normal rainfall. While normally it rains heavily for three to four days and is followed by long dry spells, this year it rained continuously with practically no respite for more than a month. Chennai received 1608.6 mm rainfall between October 1 and December 16, 2015, which was more than twice the amount of rainfall the city received during the last three months of 2014 (719.7 mm). “There are several factors responsible for the performance of the northeast monsoon in southern states. The El Niño Southern Oscillation (ENSO) along with the Indian Ocean Dipole and the Madden-Julian Oscillation (MJO), which are heating patterns in the Indian and Pacific oceans, has caused a lot of atmospheric activity. These have culminated in the rain in the southern states,” says B P Yadav, IMD director (see ‘Winds of change’). Several studies since early 2000s have pointed to a positive correlation between ENSO and the northeastern monsoon. “ENSO has been known to suppress southwest monsoons while enhancing the northeast monsoons. This year we have seen this to a great extent,” says Gibies George, a senior research fellow at the Indian Institute of Tropical Meteorology (IITM), Pune. The other global pattern that has influenced the northeast monsoon in India this year is the MJO—a traversing global oceanic and atmospheric phenomenon that has been found to have global climatic ramifications. MJO has a 30-60 day cycle that is characterised by eastward moving clouds in the tropics over the Indian and Pacific Oceans. It has been seen that when the MJO cycle is close to 30 days, it aids rainfall in the country while a cycle longer than 40 days causes suppression. “A strong MJO remained practically stationary over the Indian Ocean all through November and this has been a major factor in the heavy rainfall. The differential due to MJO has forced rain-bearing winds into the southern region of the sub-continent. The influence of MJO has been in line with previous observations,” says D S Pai, director, Long Range Forecast division, IMD. These connections are not the only newly emerging patterns regarding the northeastern monsoon. 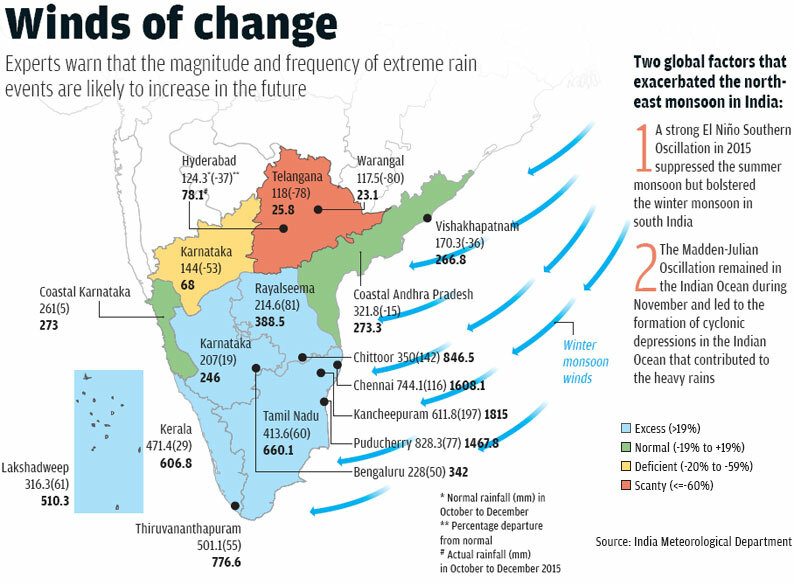 A close look at the seasonal rainfall levels in recent decades across districts in coastal Andhra Pradesh, Karnataka and Tamil Nadu reveals that the northeast monsoon has become progressively more bountiful. A 2012 study in Theoretical and Applied Climatology makes use of homogenous rain gauge data maintained by IITM to show that winter rains in peninsular India have exhibited a positive rainfall trend of 0.4 mm per day per decade between 1979 and 2010. At the same time, an increase in the number of extreme rainfall days and a decrease of normal rain days have also been observed in several parts of south India. According to George, this trend is similar to what has been observed during the summer monsoon. “We have observed that with the warming of the atmosphere, the moisture carrying capacity of the air also increases. Hence, with warming we can expect to see an increase in the magnitude of rain events and the frequency of extreme rain events. Normal rain days will become fewer and less frequent,” says George. Experts warn that rainfall during northeast monsoon is likely to increase in the future, another reason the state administration should get its act together. A 2014 analysis by the Indian Institute of Science, Bengaluru, shows that the rate of urbanisation in Chennai has increased by 20 times in the past four decades—and this came at the cost of its green spaces. 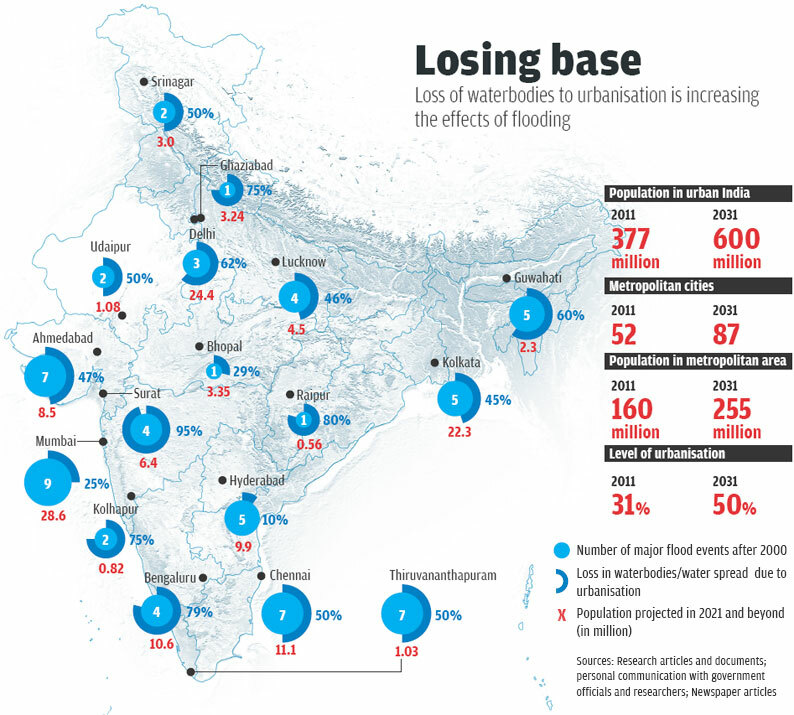 Experts say that unplanned urbanisation increases the chances and intensity of flooding in two ways. Firstly, concrete jungles obstruct and encroach upon the natural flow of waterbodies and create pockets that trap water, which increases the flood intensity. Secondly, the sewerage generated by the people gets mixed with the water and clogs the natural channels and storm water drains. Chennai suffers from both the problems. The three rivers in the city—Cooum, Adyar and Kosathalaiyar—are highly encroached upon and that has reduced the amount of water runoff into the Bay of Bengal. The city has four sewerage treatment plants at four centres, but the treated water that flows through natural channels, often gets mixed with untreated wastewater from colonies and industries on the way. Even the city’s numerous waterbodies and marshlands that should have acted as sponges are either encroached upon or over polluted. For example, in 2011, the Pallikarni marshland, the city’s biggest flood sink, was reduced to just 12 per cent of its size before Independence. The marshland, which was once spread over 5,000 ha, now houses government buildings and research institutes and a dumpyard that is gradually growing in size. The area of the Perungudi dump yard, located on the north-eastern part of the marsh, doubled—from 32 ha in 2002-03 to 75 ha in 2013, according to Tamil Nadu State Land Use Research Board. The areas affected by sewage and solid waste dumping doubled between 2003 and 2005, says a research by Care Earth, a Chennai-based research institute. M Sakthivel of the department of geography, University of Madras, says that the groundwater in the marshland is highly polluted due to garbage dumping. Experts also say groundwater recharge, which is essential for flood mitigation, has reduced substantially because of urbanisation. India is urbanising at an alarming rate, which is a cause for worry. According to the Union Ministry of Urban Development (MoUD), 31 per cent of the country was urbanised in 2011. The ministry says almost 50 per cent of the country will be urbanised by 2050. MoUD data also suggests a 54 per cent increase in the number of cities and towns between 2001 and 2011. And this rapid urbanisation has happened without proper planning, say hydrologists. “There is a complete disconnect between geological and hydrogeological cycle and urban planning,” says Saswat Bandyopadhyay, head, department of environmental planning, Centre for Environmental Planning and Technology University, Gujarat. The effects of unplanned urbanisation are already visible (see ‘Losing base’). The mangrove cover in Mumbai reduced from 28 per cent to 18 per cent between 1925 and 1994. In the same period, the city’s built-up area increased from 12 to 52 per cent. Srinagar lost almost 50 per cent of its waterbodies between 1911 and 2004. This was the major reason for the 2014 floods in the city. Bengaluru, which had 262 lakes in the 1960s, has only 10 lakes that can be called healthy. Apathy of government departments is the main reason for the degradation of urban wetlands and channels. The 2010 Wetland Rules, for example, do not have enough teeth to protect waterbodies. To protect a wetland under the rules, the state government needs to identify the waterbodies and then prepare a document. This document gets reviewed by the Central Wetlands Regulatory Authority and finally the comments are sent to the Union government, which then notifies a wetalnd to be protected. Hence if a state misses any polluted lake, it will be neglected—unless citizens approach the court. “Since urban lakes have unique ecosystem, there is a need for strong protection laws,” says Jasveen Jairath, convener of Save Our Urban Lakes, a citizens’ initiative for saving waterbodies in Hyderabad. So what should be done? According to Delhi-based non-profit Centre for Science and Environment, urban planners should undertake a detailed mapping of waterbodies, natural drainage and flood-prone areas in cities using remote sensing. And then integrate the drainage system of the city including rivers, rivulets, ponds, lakes and other natural drainage systems. The non-profit also suggests policymakers to relook the development plans approved by city authorities and find out whether they violate the hydrological cycle of the city. Finally, it calls for stronger laws to protect urban lakes and the setting up of a single authority for the management and restoration of waterbodies. The country needs a separate health policy for disasters, say health experts. Rakhal Gaitonde, Society for Community Health Services, says waiting for the National Disaster Response Force (NDRF) team for relief during disaster does not seem to be working. ªAs the frequency of disasters is increasing, there is a need for a clear policy for healthcare during a crisis.º Gaitonde says vaccination against diseases such as malaria should be started in vulnerable areas immediately after a disaster. He adds that the outreach of public healthcare centres in urban areas is limited, which further hinders rehabilitation work. ªUnlike rural areas, more than 80 per cent people in urban centres are dependent on private healthcare,º says he. Though the government checks water pollution, and epidemiological vulnerability, it is unable to cover 100 per cent of the affected population. Experts also say that health departments should have a say while giving consent to development projects. Chennai-based environment journalist S Gopikrishna Warrier says disease outbreaks are not factored in while planning for disaster management. Chennai-based health researcher Nityanand Jayaraman says the challenge is to prevent an outbreak during a crisis. "There should be clear strategies to handle the people out of any extreme situations. During the recent floods, there was no idea on where to shift people and how to provide them with basic facilities such as clean water and first aid." On the other hand, Vinod Kumar Sharma, professor and disaster management convener at the Indian Institute of Public Administration, Delhi, says that the existing national disaster management policy is sufficient to handle disasters, but the provisions are not being implemented properly. Sharma, who was a part of the team that drafted the National Policy in 2009, says medical components, including reproductive healthcare, are included under the relief provisions. "Only the implementation has to be strengthened." I cite this reference to mention that the Urban Local Bodies dealing with WRD- Water Resources Deptt. Sewerage and Storm Water control and management, and Deptt. dealing with operating the gates of salient lakes in the city, ULBs are not aware of the occurence of high tides and low tides, This is very important as if the gates of certain lakes are opened when the Port city experiences a high tide , the flow of water to drain into the sea will not be there. Also if the gates are opened at times when it is having high tide, water will flow from sea to land,,thereby causing more flooding etc.. This information on tides in coastal towns ought to be given in prominent Newspapers and others, as info is given for sun rise and sunset times etc..